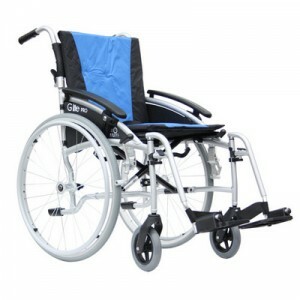 Excel G-Lite Pro Lightweight Self Propelled Wheelchair 20"
The Excel G-Lite Pro Lightweight Self Propelled Lightweight Wheelchair 20″ is based on the very successful G Lite series. The G-lite Self Propelled Lightweight Wheelchair still has the lightweight frame but is now available with 24″ self propel rear wheels. Another addition to the Excel G-Lite Pro Self Propelled Lightweight Wheelchair is the introduction of height adjustable armrests, which are not only great in helping to make the user as comfortable as possible, but due to the way they fold, it makes the chair perfect for whilst at a desk or table. • Quick release 24″ rear wheels . • Lightweight aluminium frame with a ten year frame warranty. • Half folding backrest with handy pocket on back of backrest padding. • Swing away, removable footrests.